Workwear providers sometimes write about nurses as if nursing only involves one role. But we understand nothing could be further from the truth. There are specialist roles throughout the NHS. And of course many nurses work out with the medical sector altogether in mental health, dentistry or veterinary services. The point is the roles are diverse and so are uniform requirements. So when it comes to designing nurses uniforms our workwear range is shaped by our understanding of nurses work environments and what the various roles involve. We made it a priority uniforms have to be comfortable, even in a warm environment. And the design and fabric have to allow an appropriate level of movement. We’ve made our range attractive to individual nurses and procurement. There’s no minimum order, but we offer bulk Saver Deals on some garments and our embroidery department can add logos or names to tunics, scrub tops and dresses. Popular nurses’ garments include our Step In Panelled Female Dress which is available in plain or as Step In Panelled Female Dress (Striped). The plain dresses have contrast piping and are available in Sailor Navy, Mint, Hospital, Bottle, Royal, Lilac, Sky and White. The fabric is a polyester /cotton blend which is easy to look after and durable. These dresses are available in sizes 8 to 28. With attractive colours and pricing it can be tempting to have a different dress for each day of the week! Design details include 4 pockets including a waterproof pen pocket and of course, for hygiene reasons, short sleeves. Our striped dresses are made to the same specification. These are available in a range of different stripe patterns including: Navy, Lilac, Mint, Grey and Blue. Of course we have alternatives to dresses. Why not try one of our tunics? 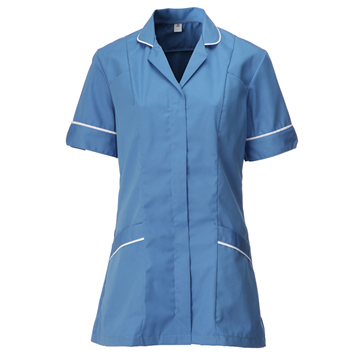 Our Female Nurses Tunic in Hospital Blue might be exactly what you are looking for. It features white contrast piping and 4 pockets including a pen pocket. It has a zip front fastening, short sleeves and back vents with action pleats. It’s available in sizes 8 to 28. We also understand colour restrictions might apply to your role. That’s exactly why we offer many other colour ways including stripes and plain colours. And to help your budget go further we also offer a Saver Deal of a Pack of 10 Female Tunics (White). The same deal is also available on our Saver Deal of 10 Male Tunics (White) but there are also other male tunics to choose from. You may also like our striped nurses tunics range! We are also aware that some nurses require Scrubsuits. Our range of Unisex Medical Scrubs are designed with theatre nurses in mind and are available in a wide range of colours including Sailor Navy, Burgundy, Jade, Royal and Light Blue and sizes XSmall to XXLarge . 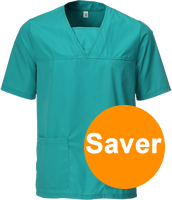 A Saver Deal on a Pack of 12 Unisex Scrub Tops – Medical Scrubs is also available. We also offer matching Unisex Scrub Trousers in the same colours and sizes. These also have a practical range of 4 pockets and have a drawcord elasticated waistband and come in 2 leg lengths. A Saver Pack Of 12 Unisex Scrub Trousers - Medical Scrubs is available and you can mix colours and sizes at no extra cost. All scrub tops and trousers are made from our specially designed poly cotton blend fabric.